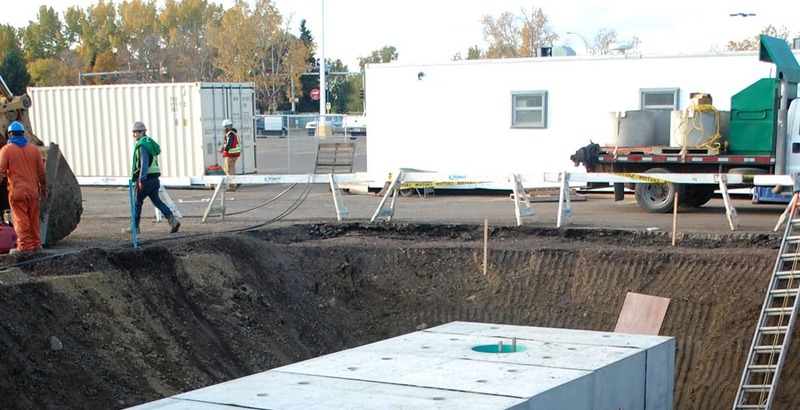 Stormwater Tanks Edmonton | Sherwood Park Mall | Tanks-A-Lot Ltd.
Redevelopment and infill are strategies for mitigating urban sprawl in growing cities. This redevelopment strains existing stormwater infrastructure which forces new and innovative solutions. The redevelopment of the Sherwood Park Mall gave an opportunity to protect the existing municipal stormwater infrastructure by preventing stormwater backups to not only the mall but the residences of the surrounding area during severe weather events. Stormwater ponds are the typical solution for stormwater buffering on sites without land constraints. With no space to construct a stormwater pond at a mall but plenty of area for parking, an underground solution to temporarily store this stormwater would be ideal. 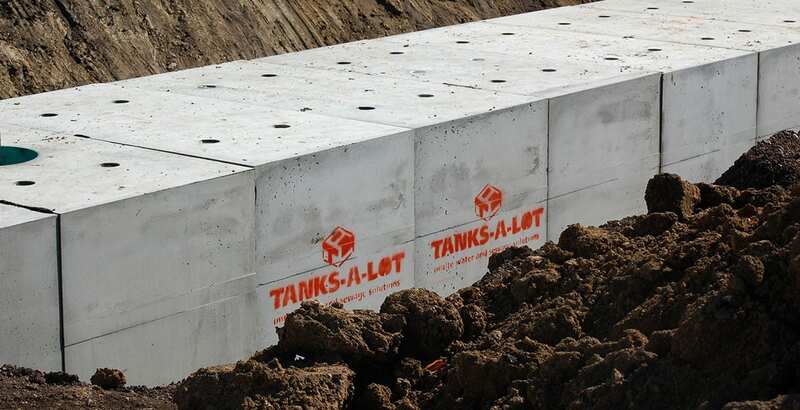 The TAL solution was a 2.4 meter square by 49 meter long precast concrete tank below the parking lot to store stormwater coming in through 2 – 200mm inlets, slowly released through 1 – 150mm outlet. 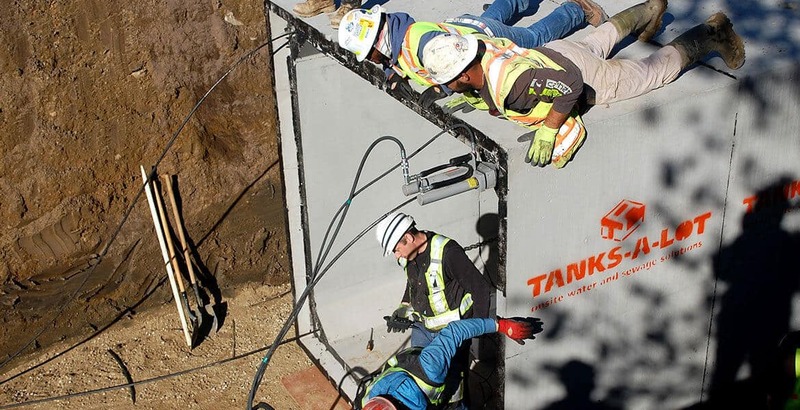 This significantly reduced the strain on the existing stormwater system by storing over 250 cubic meters of stormwater from entering the municipal system all at once. The design consisted of 2 end castings and 13 ring sections, each section sealed with 2 layers of butyl rubber sealant in the overlap joints. These sections were fastened together using continuous tensioned steel cables to provide a uniform compression in these joints and sealant. Being a precast solution, the onsite time was less than 3 days from time of open excavation to backfill and was essential in mitigating scheduling and site risk. With mall parking spaces at a premium, it was a requirement that the structure be CL625 traffic rated, which was achieved with a high performance concrete having the CAN-CSA A23.1, S3 rating and steel reinforcement.